WVHS Senior and C-TEC student, Derrek Elgarten, holds his second place poster design. 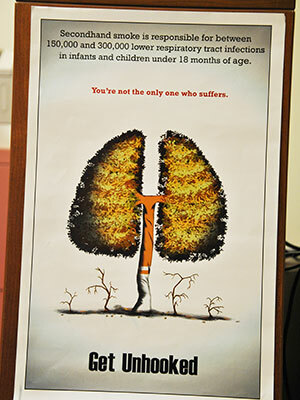 For the 23rd year, Orange-Ulster BOCES Career & Technical Education students competed in a contest to design posters aimed at getting smokers to quit. The posters were created in recognition of the 41st “Great American Smokeout,” the annual event in which the American Cancer Society challenges smokers to quit. Posters were designed by all 17 students in the Digital Design and Advertising II classes. The winning poster, which shows a mask disguising a face marred by smoking, was created by Casey LaBar, a senior at Valley Central High School. 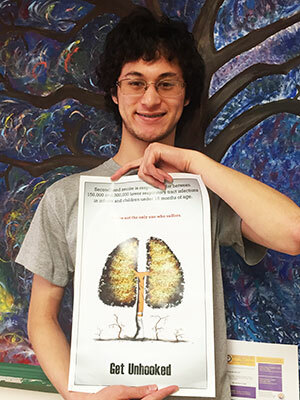 The third-place poster, showing damaged lungs suspended from a lighted cigarette, was created by Hayley Mant, a senior at Valley Central High School. The contest was organized by the Orange County Health Department. The Health Department will use the posters throughout the year in its smoking prevention campaign.